It’s a day that’s always greeted with optimism. The first day of training camp signifies the beginning of a journey, a clean slate. Opportunity, unblemished by failure and, in some cases, reality, is a potent fixture for every NFL franchise as camp kicks off. But for the 2013 Miami Dolphins, it all seems more genuine this time around. After one of the most active offseasons in franchise history, Miami held their first practice of training camp this morning in front of a max-capacity crowd. There was standing room only to watch the Dolphins. When is the last time that’s happened? If this morning was any indication, a once alienated fan base is ready to embrace the Dolphins again. Whether it was derived from the potential Ryan Tannehill showed as a rookie or a free-agency spending spree, expectations have returned for the franchise. If those expectations are greeted with success on the field, the support Miami was shown this morning will only be the tip of the iceberg. The day when Sun Life Stadium is sold out with 76,000 screaming fans will follow suit. And what a beautiful day that will be. A day after signing his rookie deal, Dolphins first-round pick Dion Jordan was placed on the non-football injury list as he continues to recover from offseason shoulder surgery. Jordan is still expected to be one or two weeks away from being cleared to practice. That’s certainly not great news for the rookie, who may be forced to sit out Miami’s preseason opener on August 4th, but it’s not the end of the world. Jordan should still have two or three weeks to get ready for the regular season. “Right now I’ve got to take care of my body first,” Jordan told reporters after practice. After spending the majority of the offseason with the starters, many expected Olivier Vernon to drop back to the second-team as Randy Starks returned to action and Jared Odrick moved back to defensive end. But nothing changed on camp’s first day. Vernon remained the starter alongside Cameron Wake while Odrick stayed put inside at defensive tackle. Odrick and Starks split time on the first team with Paul Soliai. It looks like Vernon, who recorded two sacks this morning, is going to be given every opportunity to earn a starting spot. And when Dion Jordan is deemed 100 percent, he’ll have a shot at the job as well. It should be interesting to monitor how the defensive line shapes up as camp progresses. On the first play of 7-on-7’s, Mike Wallace got open deep behind cornerback Brent Grimes, showcasing the elite speed he was brought to Miami for. But a Ryan Tannehill overthrow prevented some early-practice fireworks. 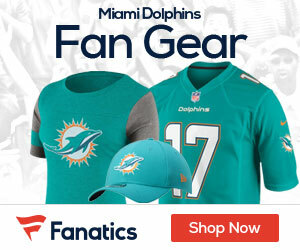 When Tannehill and the other quarterbacks put passes intended for Wallace on the money, reports of a few catachable drops by the $60 million man highlighted a rough day at the office for the Dolphins’ passing game. But it was just the first day. If these reports continue two or three weeks into camp, there may be something to worry about. For now, relax. There was one receiver who impressed. Marvin McNutt reportedly made several plays, catching a handful of passes from Matt Moore. Armon Binns and Rishard Matthews entered camp as the favorites to win the No. 4 and No. 5 receiver spots, but McNutt can change that in a hurry if practices like this morning’s become a trend. And if he’s unable to top Binns and Matthews on the depth chart, he could convince the Dolphins to keep six receivers. But we’ll hold off on further speculation until we see McNutt demonstrate some consistency. Cornerback Jamar Taylor (hernia), guard Lance Louis (knee) and offensive lineman Dallas Thomas (shoulder) all returned to the practice field this morning after sitting out offseason work. Taylor and Louis will both have the opportunity to compete for starting jobs. Taylor is expected to compete with Richard Marshall and Lance Louis will battle John Jerry. Cornerback Brent Grimes continues to be the Dolphins’ most impressive free-agent acquisition. Armando Salguero of the Miami Herald raved about how well Grimes moved in coverage, showing no signs of the torn Achilles he suffered last season. Two players that have struggled keeping their weight down in guard John Jerry and fullback Jorvorskie Lane reported to camp in good shape. Jerry is listed at 335 while Lane is listed at 258. If true, both players cut some weight over the offseason. Center Mike Pouncey refused to talk to the media about the “Free Hernandez” hat he wore last weekend. It doesn’t look like Mike will be apologizing like twin brother Maurkice. Dan Carpenter isn’t going quietly into the night in his battle with fifth-round pick Caleb Sturgis. He made all ten of his field goal attempts today, including a boot from 49 yards. Sturgis, who is the favorite to win Miami’s starting kicker job given his inexpensive rookie contract, won’t kick until tomorrow’s session. Up next: The Dolphins will hit the practice field for day two Monday morning at 8 a.m.